The prank came amid reports of significant risks ahead for the manufacturer, which is heavily indebted and has not turned a profit since it began operating in 2003. 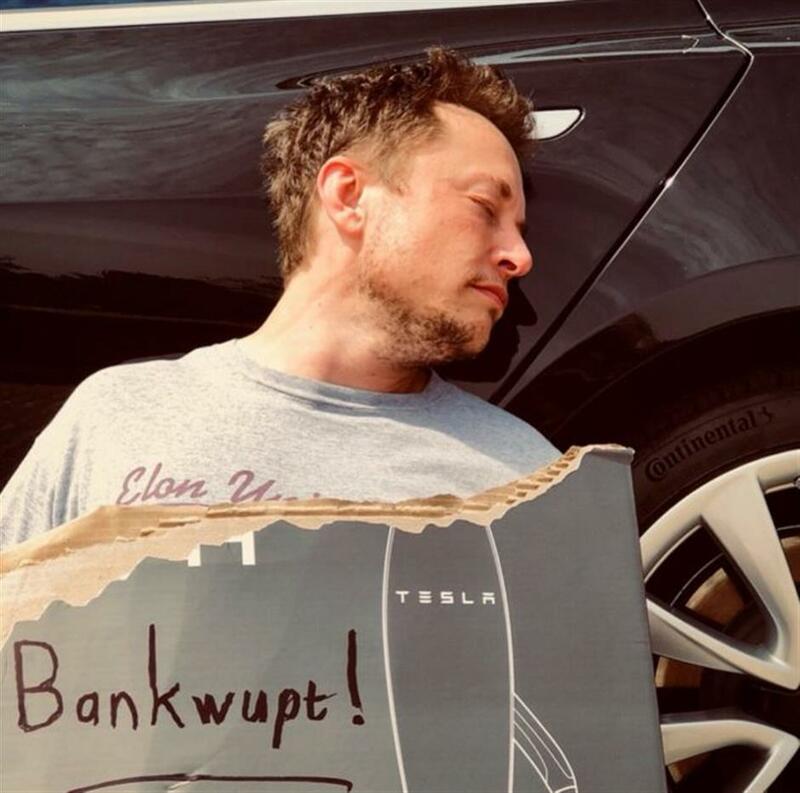 A tweet posted by Elon Musk shows the Tesla CEO seemingly passed out with his head on a Tesla Model 3 while holding a sign that read "Bankwupt!" Elon Musk, the flamboyant boss of Tesla and SpaceX, took to Twitter on April Fool's day to joke the electric car-maker, which has been rocked by bad news, was going bankrupt. "Despite intense efforts to raise money, including a last-ditch mass sale of Easter Eggs, we are sad to report that Tesla has gone completely and totally bankrupt. So bankrupt, you can't believe it," he wrote. He later posted a picture of himself pretending to be passed out with his head on a Tesla Model 3 while holding a sign that read "Bankwupt!" It has lost about a quarter of its share value since the end of February, and is also currently under investigation by the US National Transportation Safety Board following a fatal accident involving one of its cars in California on March 23. Tesla confirmed on Saturday its "Autopilot" feature was engaged during the accident but said the driver ignored repeated visual and audio warnings and his hands were not detected on the wheel for six seconds prior to the vehicle's collision with a highway barrier. The car caught fire before two other cars struck it. The driver was identified by The Mercury News as a 38-year-old man, Wei Huang, an engineer for Apple. He later died in hospital. According to reports in the US media, the NTSB was unhappy that Tesla had released information before a final investigation was completed. A spokesman told The Washington Post: "At this time the NTSB needs the assistance of Tesla to decode the data the vehicle recorded. "In each of our investigations involving a Tesla vehicle, Tesla has been extremely cooperative on assisting with the vehicle data. However, the NTSB is unhappy with the release of investigative information by Tesla." The NTSB previously investigated a crash involving an autopilot-equipped Tesla in Florida in 2016.